Over the last decade we have seen lean start to permeate many different industries. Healthcare is one of the most prominent areas. Another more publicized area lean is permeating is government work. A challenge was even given to all the Presidential candidates. This is a great start. It shows that more and more people are starting to understand lean is about the way we think and see things. It is not about tools such as: 5S, Standardized Work, Quick Changeovers, or level loading. There is one industry that has been slowly adopting lean, but rarely gets mentioned. That is the construction industry. More and more construction companies are trying to adopt lean principles and thinking into the work they do. Lean construction is more than just the building phase of construction, but also includes the design phase. Lean construction involves owners, architects, designers, engineers, constructors, and suppliers. It is all inclusive from end-to-end. There is even the Lean Construction Institute. It was established in 1997. This isn’t a new concept to the industry. It just doesn’t seem to get well publicized. Lean construction provides a solution that works for all three groups-the owner, the contractor and the worker-because it’s founded on collaboration, communication and mutual respect. Not only does the conventional design-bid-build environment not produce the best results for any of the three groups, it actually pits each of them against each other and creates a downward spiral of lose-lose. 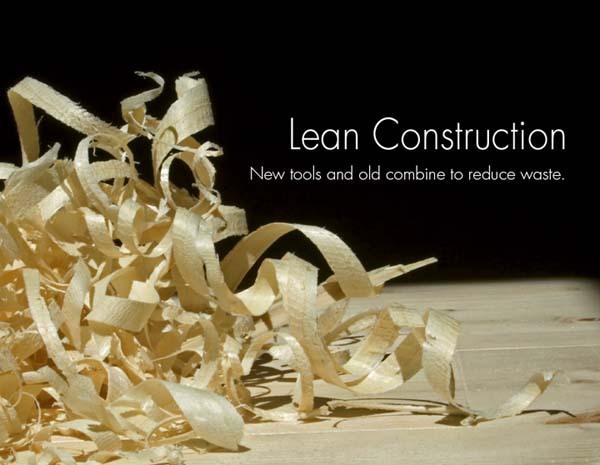 Lean construction works because it focuses on maximizing value and eliminating waste. It is a win-win for everyone with a focus on what is important to the customer. It is great to see industries outside of manufacturing and healthcare understanding the lean principles and embracing them. If anyone works for a lean construction company, I would love to hear from you and ask you questions about implementing lean in the construction industry.